First, the terminology; most use Black Asian Minority Ethnic (BAME) or Black Minority Ethnic (BME). However, this includes white minorities so I use Visible Minority Ethnic (VME). I prefer not to use the USA term ‘People of Color’ due to the negative connotation in the UK with the word ‘Coloured’. I also do not like the word ‘Black’ to describe people who are ethnically African or African Caribbean as they are not actually black. I feel it is better to use descriptions, not a reference to colour, which is in any event incorrect. Some prefer Global Majority, as VME people are a minority in the West. However, I do not align with this as we are talking about British people, not people living abroad. The only exception is that I use ‘White British’ as this is the only phrase I have heard used. I believe that NCMES are unwittingly institutionally racist and contain only people who have benefited from ‘White Privilege’. There is a mono ethnic view of how our society should engage with nature which excludes VME experiences. NCMES must accept that their staff have an unconscious bias which results in racism. As well as others at Black2Nature, I have experienced racism, aggression and abuse from NCMES staff. The organisations must understand that they are experts in nature, not Equality, Diversity and Inclusion (EDI) and VME cultures and communities and the same goes for VME naturalists unless they can demonstrate EDI expertise. I get a huge amount of aggression on social media when I talk about NCMES and Race. People are not prepared to listen and are defensive as they see themselves as the hero and cannot understand that sometimes they are not. Most VME communities view themselves as urbanites who do not belong in the countryside, but also worry about visiting this landscape because of a fear of hate crime. NCMES have failed to engage VME people and are unable to connect because their staff cannot relate to, understand, target or include them. They must reach out and connect with communities in their own spaces and places. Inequality of engagement creates inequality of opportunity and an unequal planet cannot be a sustainable one. NCMES must not be given credibility, funding or support if they are not prepared to become diverse. The Natural England 2016 MEME Report looked at how often children visited green spaces. 74% of non VME children visited frequently, which drops to 56 % for VME. 77% of children from higher socio-economic groups (A & B) visited frequently whilst 65% for lower socio economic groups (C & D). Therefore, clearly race and ethnicity have a larger impact than poverty, although this does have an impact. I have interviewed VME elders about their lives growing up “back home”. All talked about their rural childhoods, swimming, being out in nature and helping on family small holdings. However, their grandchildren’s generation mistakenly think their heritage is urban, however we can still engage them by referring back to their country of ethnicity. 83% of British people live in cities, with a disproportionate number of VME living in bleak inner cities. NCMES must step outside their echo chamber circles and communicate with people from all ethnicities and backgrounds. There is no excuse for NCMES’ HR, IT and Finance teams being White British, especially if their headquarters are within commuting distances of diverse cities. Diversity brings a wider range of people to organisations and leads to improved performance. Only 0.6% of environmental sector professionals are VME, making it the second worst sector after only agriculture. In my experience, there are significantly less VME people working in nature conservation compared to the environmental sector and most NCMES admit to having no VME staff. These shockingly low numbers mean that there are virtually no staff that can relate to, target and include VME people. At the 2016 Race Equality in Nature Conference, VME Race experts identified barriers such as the countryside being elitist, fear of hate crime, lack of public transport, cultural fear of dogs and lack of suitable clothing. Education is also a problem. Even if a VME child is interested in a career within NCMES, it is difficult for them to pursue it and their parents will not be supportive of a career they are not familiar with. Many NCMES jobs also require a large amount of unpaid work experience or volunteering – another barrier for people who are from low income backgrounds, do not have access to the countryside, or lack direct contacts. Images of and articles about only white people are very alienating, especially when entire programmes, websites and magazines are without a single VME face. This reinforces the idea that nature is not for us. Some people tell me that it is impossible to interest young people, especially VME ones, to get out into nature. However, to interest them, you have to make nature relevant; this means packaging nature in a way that means that the person can relate to it. For example, at the beginning of our first camp, the teenage boys were restless and frustrated. A volunteer talked to them about the speed a peregrine falcon drops before catching prey and compared it to the speed of a Formula 1 car. The boys were mesmerised because they could relate a species in nature to something they loved and understood. Another idea I had was that I identified that lots of teenagers want to learn how to use YouTube, so, I organised a free film-making workshop in an inner-city park for VME teenagers which was run by local TV film-makers. 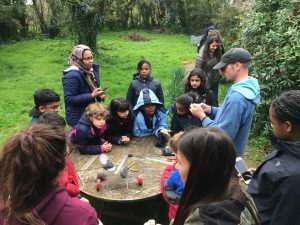 We used nature as a forum for the workshop, which was sold out, where the teenagers came to learn about something they were interested in. I call this ‘nature by stealth’. Many of the teenagers who attended this event, then came to our nature camp a few weeks later. I have given talks to geography and science teachers at their annual conferences about how to engage their VME pupils in topics such as climate breakdown and wildlife and suggested that they related lessons back to their pupil’s ethnic origins. So, a teacher in Tower Hamlets in London might talk about the ways that climate breakdown was already impacting people in Bangladesh or about Bangladesh’s Sundarbans and the tigers that are still living there. Many VME parents do not let their children attend school camps and so it is important that camps and events are culturally and religiously aware and appropriate. By this, I mean understanding the differences between the organisers and people from other countries or ethnic backgrounds, so especially differences in attitudes and values. In particular, for wildlife camp organisers, this would be understanding the different cultures and religious needs of the children and parents you are targeting, ensuring that they are met and communicated. For example, we stress that our camp is vegetarian, apart from one takeaway meal when fish and chips is offered, but we ensure this is halal. We also highlight that we have adults sleeping near the entrance of the boys and girls tents so that intruders cannot enter and the children cannot get together after dark. Our camps are successful because we are Muslim and can re-assure parents with this. Many of our children have missed out on school camps. We also have to be open to mums coming too, as they want to come and understand how it all works, as they have never been out in the UK countryside before or camped. Accept and acknowledge that they have an issue with Race specifically with Institutionalised Racism. Obtain advice from VME Race & culture experts, such as Black2Nature, to formulate a Race plan that Black2Nature can assist with. But do not expect consultations to be free. Make diversity an overriding core value (in the same way that health & safety was improved by becoming a core value in industry). Monitor, measure and publish diversity data for Trustees, employees, volunteers and members. Adopt excellent equal opportunities and recruitment policies, targeting VME communities and ensuring unnecessary requirements aren’t included. Train all Trustees, staff and volunteers on Race. All media, whether printed or online, must be diverse in content and images should be reflective of UK society. Every document should pass a “diversity check” and VME role models should be visible on nature TV. Make nature relevant, for example using “nature by stealth”, referring back to nature within the country of ethnic origin and offering camps that are culturally and religiously relevant and appropriate. Provide information evenings targeting VME secondary age children and their parents, explaining careers in conservation and encouraging interest in relevant degrees. Mentor VME students on nature degrees to combat racism and isolation. Provide scholarships and internships to VME students from low income families, ensuring there are always VME Race experts on selection panels. She has been involved in the UK organisation of the Youth Strikes encouraging young people from around the world to not go to school once a month and protest instead, demanding immediate action to prevent climate breakdown. She was a Bristol European Green Capital Ambassador along with Tony Juniper, Simon King and Miranda Krestovnikoff. She has also been listed with the singer-songwriter George Ezra and actress Maisie Williams from Game of Thrones as one of Bristol’s most influential young people. During 2019, she will have helped to arrange 8 camps for inner-city children and teenagers. She will have organised three Race Equality in Nature Conferences aiming to increase the ethnic diversity in nature and there are plans for two more. She has also set up Black2Nature with the aim of working with organisations to increase the access to nature of Visible Minority Ethnic people. Please connect with her on LinkedIn (Mya-Rose Birdgirl Craig). She has given over 50 talks, speaking at conferences on Sustainability and the Future of Cities alongside the likes of George Monbiot and Caroline Lucas. She is a Minister in Chris Packham’s Manifesto for Nature in 2018 and spoke in front of 10,000 people at the Walk for Nature. She has also appeared on TV and radio. She has been awarded the Bath and West Show Environmental Youth Award 2017 for Bristol for her Black2Nature work. She was also listed as one of Bristol’s BME top 100 powerlist 2018. Please read her blog http://birdgirluk.blogspot.com, like her Birdgirl Facebook Page and follow her on Birdgirl Twitter.